Credits: Paper by Nadi Designs AoD_bloghop (dark green); Elements — PWD Christmas Treasures (staples); SDynes Christmas Elements (bracket); ScrapMatters Life Little Surprises kit – border By Becca. As I got off the plane, I look up and there it was – a central feature reaching 2,460 meters above the Albay gulf. Mayon Volcano stands majestic with its perfect cone forming a magnificent backdrop against an otherwise ordinary small town airport. Mayon hiding behind the clouds. A very active volcano with its most recent eruption occurring in 2001 while its most violent in 1814 killing around 2,000 residents and devastating several towns. 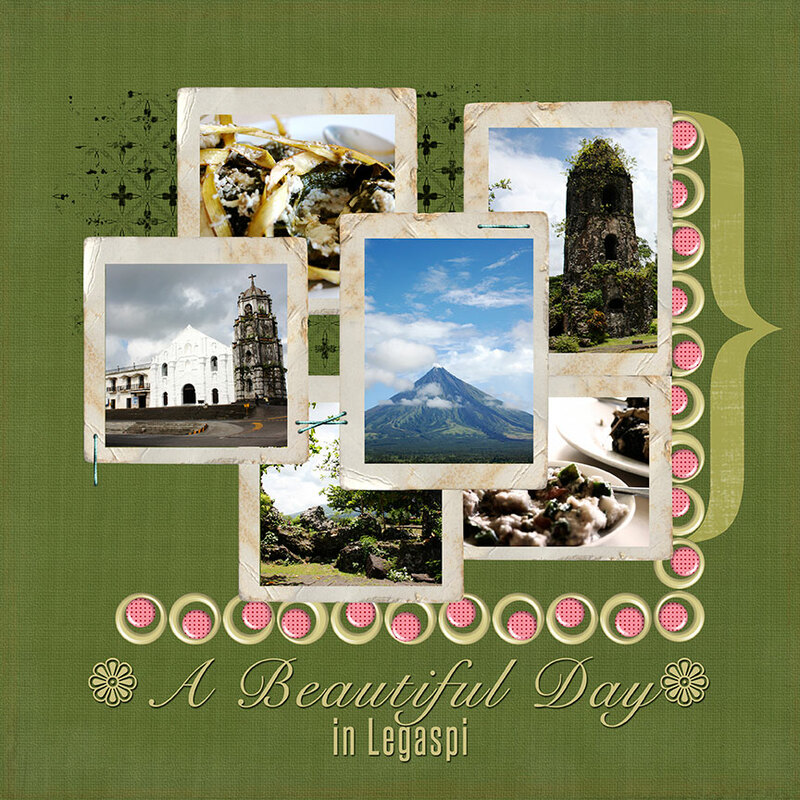 If not for Mayon Volcano, Legaspi is an ordinary city riddled with tricycles. 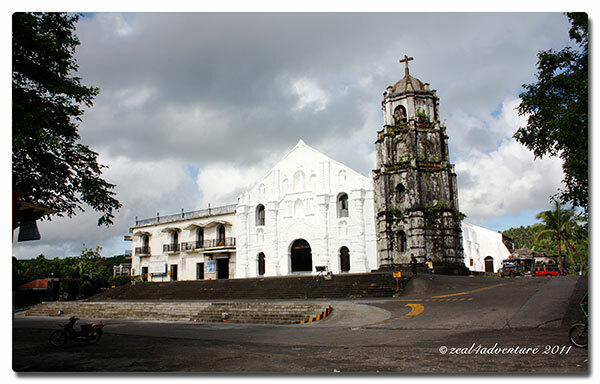 The capital of Albay was our gateway to Donsol, the main purpose of this trip. The cab we hired to take us to whaleshark territory suggested that we take advantage of the clear sky affording a spectacular image of an almost perfect cone. 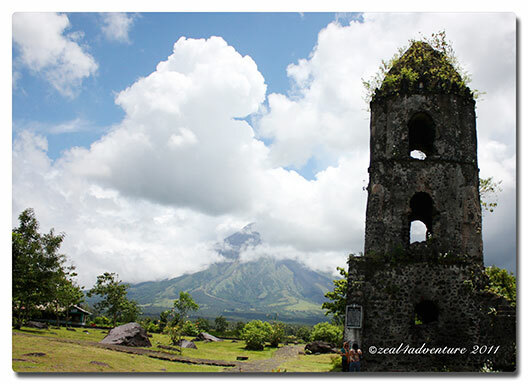 We headed out to Daraga Church right after breakfast for an unobstructed view of the volcano. 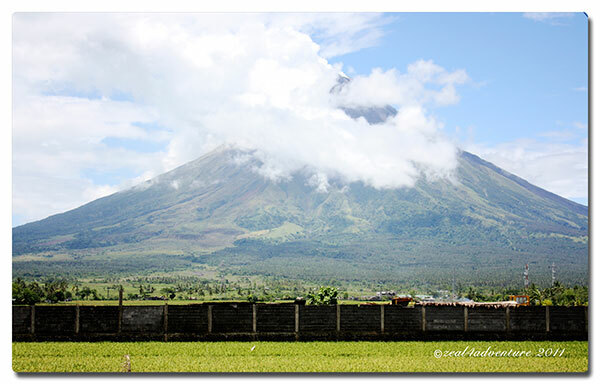 It sits atop a hill overlooking the sea and the majestic Mayon. Declared by the National Historic Institute a “National Cultural Treasure”, the 18th century baroque church was built in 1773. Mayon’s destructive eruption on Feb 1814 devastated Cagsawa and 4 more towns and survivors chose to move to Daraga the following year. So the folklore indicating that the church was built to replace the ill-fated church of Cagsawa is inaccurate. 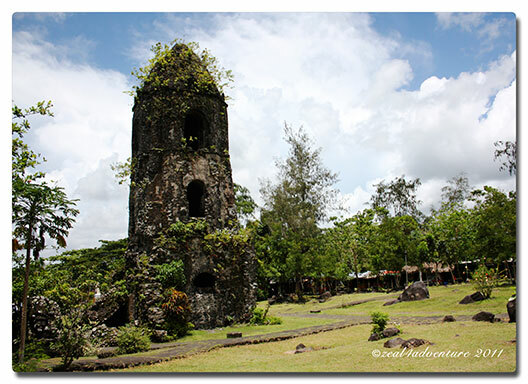 The remnants of the Cagsawa Church, of which the belfry still stands today, is a testimony of mother nature’s wrath and reminds of the dangers of living close to Mayon. Huge volcanic boulders left around the perimeter. 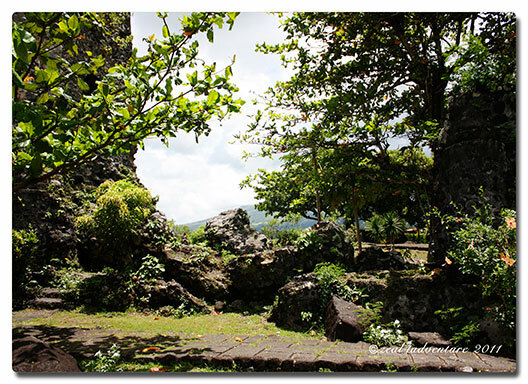 Also affording an unhampered view of the volcano, the ruins is the most photographed spot in all of Albay. Although clouds have covered half of Mayon by now, it remains picturesque just the same. 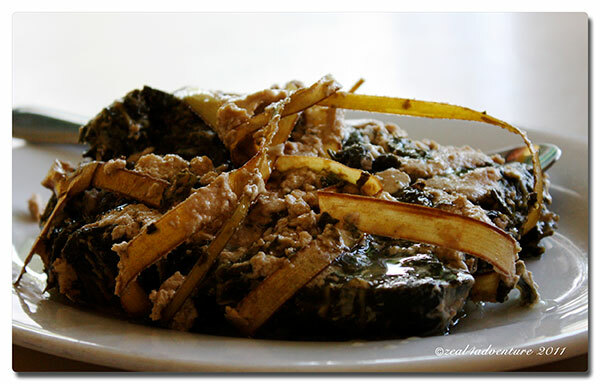 When in Legaspi, make sure to drop by Camalig and have a feast of their Pinangat. 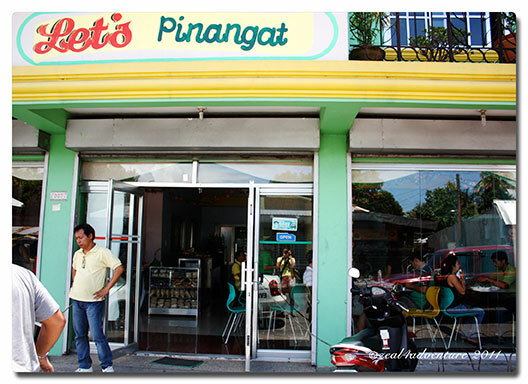 Along the highway is an eatery called Let’s Pinangat. Before heading to Donsol, Art, our cab driver parked the cab and announced that we are to have lunch here. Of course we ordered Pinangat but Art highly recommended Inolukan, a variation of the pinangat, which is pure layers of gabi (taro) leaves cooked in coconut milk. 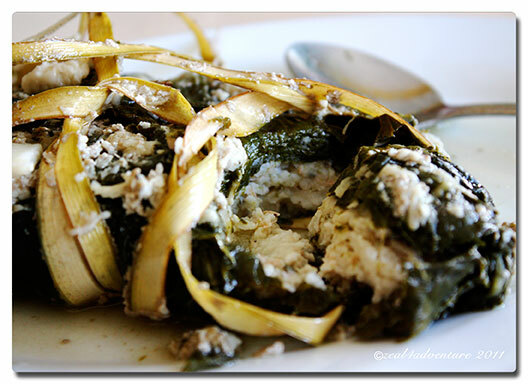 Inolukan, on the other hand has extracts of small crabs (talangka) filled inside the leaves. Both I find excellent with a slight preference over the latter. We had, I dare say, a good start to a weekend of adventure. ‘Twas a beautiful day indeed. If you need a ride to around Albay, call Art of Early Riser. He can double as a guide as well. Previous postSwim. Snorkel. Fish. Eat. 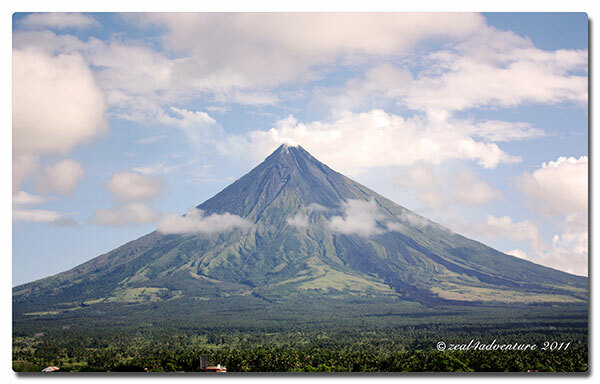 timeless beauty – that is the mayon. What a beautiful place! Timeless beauty indeed! Incredible shots of the volcano and the ruins of the church are lovely! Terrific post for the day! Thanks for sharing! What lovely shots – such an amazing place! What a wonderful travel post. Great pics and interesting facts. great post with crisp info about the place. also, i loved the shots of the volcano! you got beautiful photos, you’re lucky not many people are in the ruins. Thanks for visiting my post too.